Permanent garden paths reduce weeding and mowing time — they can also be easy, quick, and inexpensive to make. 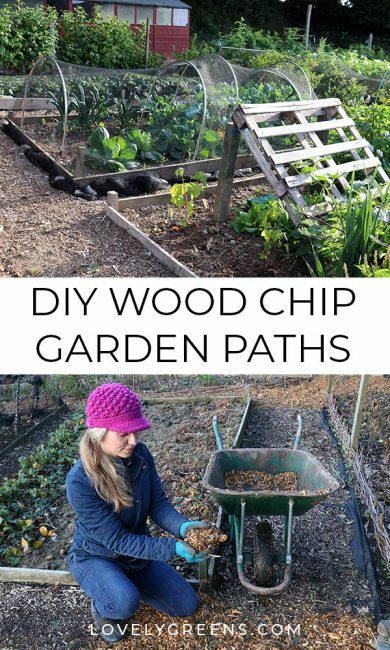 Here’s instructions on how to make wood chip garden paths. 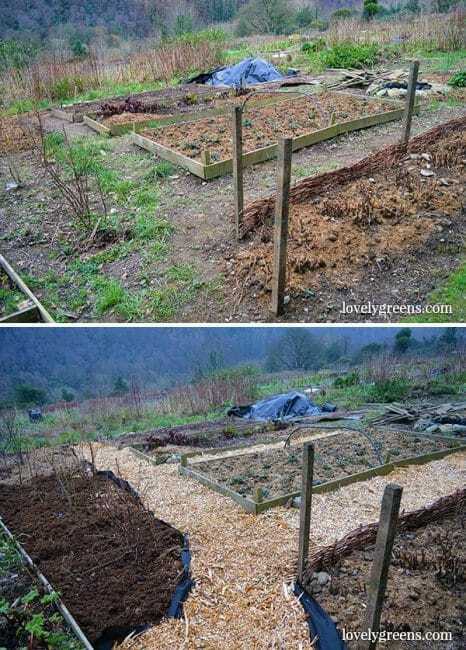 Years ago I watched as a fellow gardener laid down wood chip garden paths between their raised beds. I thought at the time that they looked nice but that they could interfere with the soil and the garden beds. Years passed and not only did the paths keep the plot tidy, the raised beds and crops didn’t suffer at all. On the contrary, they thrived. After battling with weedy paths for years I decided to take the plunge. Now I wonder why I didn’t jump on the idea sooner. 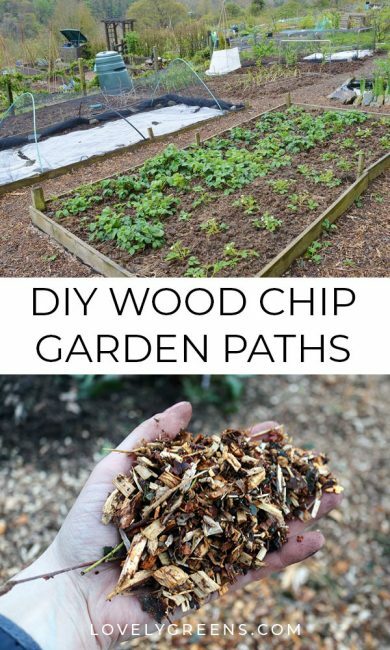 Wood chip garden paths are quick and inexpensive to create, suppress weeds, look attractive, and have helped me to focus my work on tending crops. If you’re all about working smarter rather than harder here are my tips on how you can create your own. Before and after. Wood chip paths have really made a difference to my garden. 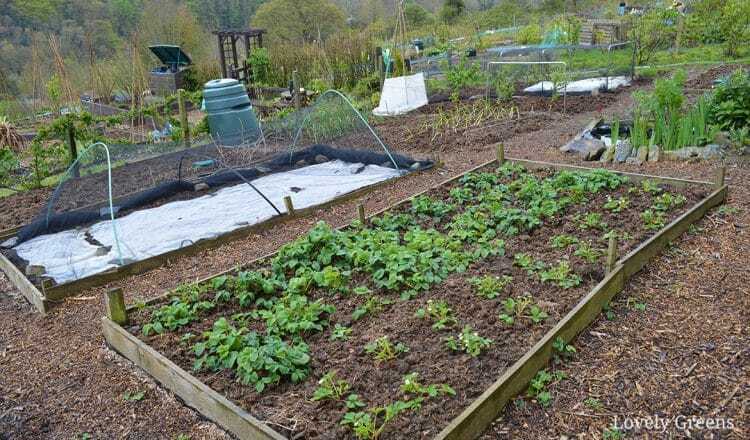 Raised beds are infamous for drying out quicker than the soil around them. 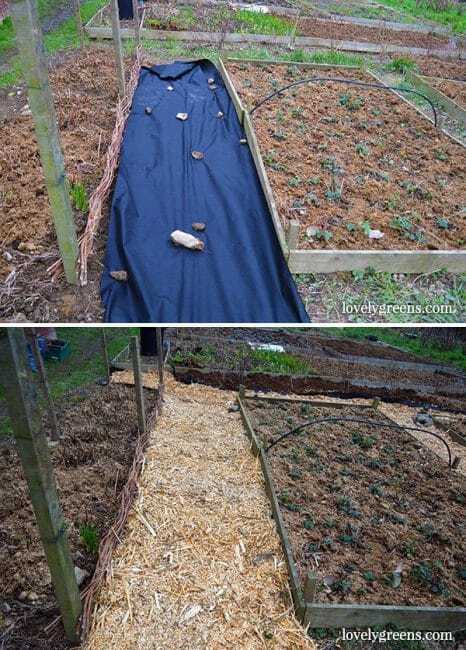 Wood chip paths help keep moisture in the soil underneath and so stop it from wicking as much water from the beds. Fungi will colonize the wood so you’ll likely get mushrooms over time. Not a big deal in my opinion. As more of the wood chips become humus, plants can start growing in the paths. A fresh layer of wood chips stops this though. It’s really very easy to create your pathways. If you have an established garden just mow and/or weed your paths between. Try to remove as many stones and any perennial weeds that you find growing at the edges. If you’re working from a blank slate, measure your beds and pathways out first. The paths should be a minimum of 18″ wide to accommodate a wheel barrow. Next lay down a weed suppressant material. It could be cardboard or for a heavy duty solution go with landscaping fabric. Whatever you do, avoid plastic. I had a bit of leftover plastic sheeting and tried using it at first. Just imagine a hidden ‘slip and slide’ running right across your garden. No photos or video exists of that experience thank goodness! I used fabric in my allotment garden and found that it blew around a lot. A few stones weighing it down did the trick before moving on to the next step. Bring in your wood chips and lay them down at least an inch thick, if not thicker. I use two methods to get them down. The easiest way is to dump small piles of them along the length of the path and then spread them out. For more accurate covering, I throw handfuls of wood chips where they need to go. For my entire garden it took three hours to spread the fabric and to cover it with wood chips. If you use stones or anything to weight the material down, remove them as you work. I’ve done practically nothing after laying my paths down. 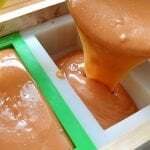 Over the past two years the color of the wood changed to a more muted and natural shade and the lower levels broke down into humus. I’ve not had any issues with muddy paths yet but can see how that could become an issue. That’s why I hauled in load after load of wood chips to completely resurface my paths. It’s almost two years exactly since I created them and this time it only took me two hours to spread. I needed about 15 wheelbarrow loads for my allotment garden that’s sized about 30X20′. I didn’t remove any of the old wood, just laid new material on top. Many people choose to use cardboard as their weed suppressant material. It’s natural, free, and breaks down over time. If you’re planning on covering a grassy area with a wood chip path it might be the way to go. In my case, my garden had a lot of perennial weeds — dock and creeping buttercup for two. There are also a lot of perennial weed seeds in the soil so landscaping fabric was the right option for me. Without it, weeds will grow right through the wood. I’ve had someone ask if landscaping fabric stops or kills worms in the soil underneath. 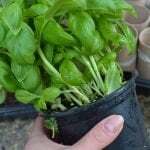 It doesn’t, and with it being water permeable the soil underneath is plenty moist for them. Even more moist than if there were nothing on top of the soil. My pick for landscaping fabric in the USA, and in the United Kingdom. The best place to get wood chips is from a local tree surgeon — I found this out from a friend who works in garden maintenance. I rang up his contact, Dave Rielly, and asked if he had wood chips available (yes) and how much it cost (nothing). He literally delivered an entire truck load to the allotment for FREE. Not only that but he’s bringing in another load for the whole allotment’s use tomorrow. I’d recommend that you do the same as me and see if you can get wood chips that way. They’re a waste material for people who work with trees and often they’ll be inexpensive or free. 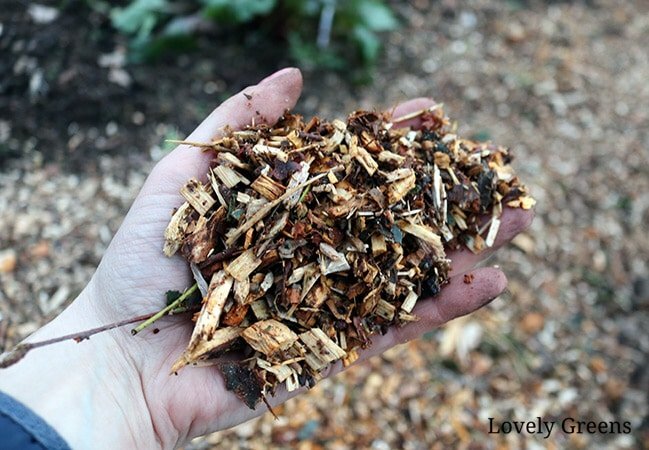 The wood chips in my garden are a mixture of soft-wood and hard-wood. Basically whatever trees Dave had been working on at that time. One type of wood that you should avoid is black walnut — it contains compounds that will kill other plants. 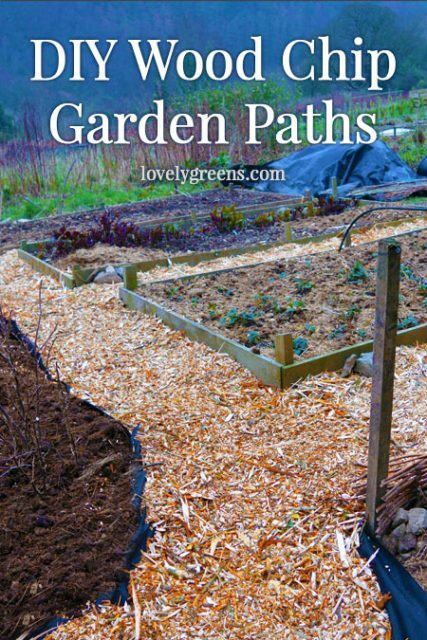 Wood chip garden paths look great, feel good to walk on, and keep weeds down for years. I highly recommend them to anyone who’ll have a listen. 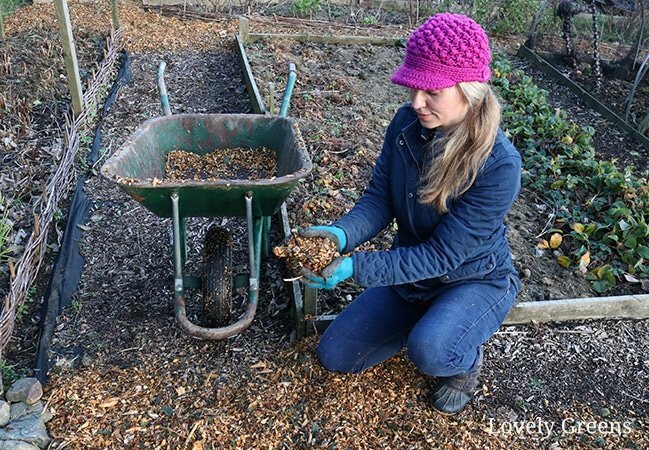 Have a watch of my video below to hear me explain more about my paths and to see how I lay down new wood chips down this year. You’ll also see the full effect that they give my garden. 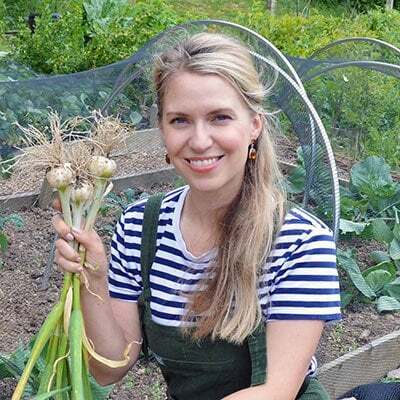 Oh, and make sure to subscribe to Lovely Greens on YouTube — I produce weekly gardening videos that I’m sure you’ll find helpful. 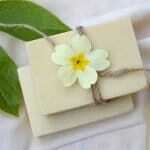 It would be fun to see a video on making homemade paper , with seeds or flower petals mixed in . 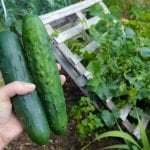 Also a video on how to begin a “No Dig ” garden . Sawdust also works well. It breaks down in time and can then be shovelled onto garden beds and replaced. In addition, snails do not like crossing sawdust! I agree that sawdust works well but you do not want it close to the house – it tracks in on shoes. Wood chip doesn’t. Neat! 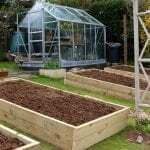 I am having my husband build me some raised beds (I have terrible arthritis in one knee, so no kneeling or much bending) and was trying to think how to mulch in between. This is perfect! 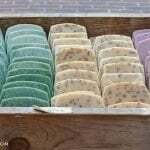 I looked into landscape fabric on a gardening website and it was PRICEY! Didn’t think to check Amazon. Thanks for the timely suggestion!